Although duodenal stump leakage (DSL) is a relatively rare complication after gastrectomy with Roux-en-Y (R-Y) reconstruction, it is difficult to treat and can be fatal. We investigated the impact of duodenal stump reinforcement on DSL after laparoscopic gastrectomy with R-Y reconstruction for gastric cancer. 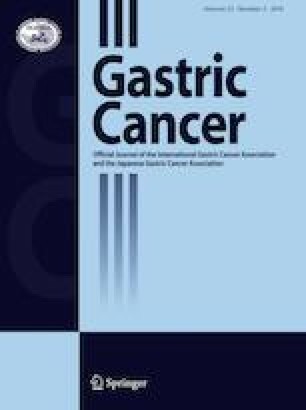 This retrospective study of 965 patients with gastric cancer who underwent laparoscopic distal or total gastrectomy (LDG or LTG) with R-Y reconstruction compared surgical outcomes between two groups, the duodenal stump reinforcement group (reinforcement group) (n = 895) and that without duodenal stump reinforcement (non-reinforcement group) (n = 70). Mean operative duration was significantly longer in the reinforcement than in the non-reinforcement group (LDG; 291 min versus 258 min, p < 0.001, LTG; 325 min versus 285 min, p < 0.001). DSL occurred less frequently in the reinforcement than in the non-reinforcement group (0.67% vs. 5.71%, p < 0.001). Furthermore, non-reinforcement was an independent risk factor for DSL in multiple logistic regression analysis with adjustment for potential confounding factors. Patients with DSL in the non-reinforcement group all required re-operation, while all but one patient with DSL in the reinforcement group recovered with conservative management. Duodenal stump reinforcement in laparoscopic gastrectomy with R-Y reconstruction may reduce the risk of DSL development and minimize its severity. The authors declare that this study have no external funding. All procedures followed were in accordance with the ethical standards of the institutional and national committees governing human experimentation and in compliance with the Helsinki Declaration of 1964 and later versions. Informed consent or an appropriate substitute was obtained from all patients prior to their inclusion in the study.